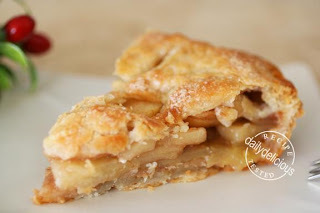 My nephew loves apple pie, every times that he comes to my house this is the pie which I have to make. But I don’t like to stick to only one recipe, so every times, I try new recipe. This time the recipe comes from: ...................... and I’m not disappointed. The pie dough is very easy to make (I forgot to take the picture, =*=). The trick of sprinkle the bottom of the pie with the graham cracker crumbs is great; I find the bottom is less soggy than usual. The taste is great, but I had to use square pan instead of the round one because I just couldn’t find my glass pie pan in my cup board (and I still wander where it is, I reorganized my cup board after that and still couldn’t find it, oh mine). Luckily the pie came out well, and I post this recipe for my sister, so she can make it at home as she told me that the apple tree in her back yard gives her a load of apple. Hope she will find it’s easy too. *Note: start by making the pie dough first, then make the filling. Put the flour, sugar and salt in a food processor fitted with a metal blade; pulse just to combine the ingredients. Drop in the butter and shortening and pulse only until the butter and shortening are cut into the flour. Until you have some pieces the size of fat green peas and others the size of barley. Pulsing the machine on and off, gradually add about 6 table spoons of the water add a little water and pulse once, add some more water, pulse again and keep going that way. Then use a few long pulses to get the water into the flour. If, after a dozen or so pulses, the dough doesn’t look evenly moistened or form soft curds, pulse in as much of the remaining water as necessary, or even a few drops more, to get the dough that will stick together when pinched. Big pieces of butter are fine. Scrape the dough out of the work bowl and onto a work surface. Divide the dough in half. Gather each half into a ball, flatten each ball into a disk and wrap each half in plastic. Refrigerate the dough for at least 1 hour before rolling. GETTING READY: Butter a 9-inch deep-dish pie plate (I use a square pan). GETTING READY TO BAKE: Center a rack in the oven and preheat the oven to 425 degrees F. Peel, core and slice the apples into slices about ¼ inch thick. Put the apples into a large bowl and add the sugar, lemon zest, tapioca (or potato flour), cinnamon, nutmeg and salt. Toss everything together really well. Let the mix sit for about 5 minutes, until juice starts to accumulate in the bottom of the bowl. Remove the pie plate and top crust from the refrigerator and put the pie plate on a baking sheet lined with parchment or a silicone mat. Sprinkle the crumbs evenly over the bottom of the crust and then turn the apples and their juices into the crust. The apples will heap over the top of the crust. Pat them into an even mound. Dot the apples with the bits of cold butter. 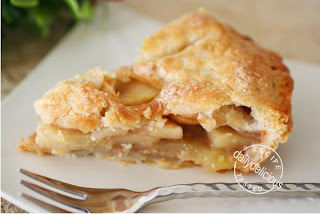 Very lightly moisten the rim of the bottom crust with water, then center the top crust over the apples. Either folds the overhang from the top crust under the bottom crust and crimps the crust attractively, or presses the top crust against the bottom crust and trim the overhang from both crusts even with the rim of the pie plate. If you’ve pressed and trimmed the crust, use the tines of a fork to press the two crusts together securely. Use a sharp paring knife to cut about 6 slits in the top crust. Use the wide end of a piping tip to cut a circle out of the center of the crust as a steam vent. If you’d like, brush the top crust with a little milk or cream and sprinkle it with sugar. Bake the pie for 15 minutes. Lower the oven temperature to 375 degrees F, and bake the pie for another 50 to 60 minutes (total baking time is between 65 and 75 minutes), or until the crust is gorgeously browned and the juices bubble up through the top crust. After about 40 minutes in the oven, if the top crust looks as if it’s browning too quickly, cover the pie loosely with a foil tent. Transfer the pie to a rack and let it rest until it is only just warm or until it reaches room temperature. 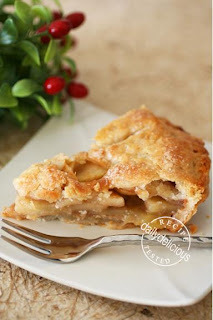 ur apple pie is an absolute beauty! Really feel like making it now! would that be 3 or 4 apples? The amount of the apple is wrong, and I already corrected it. Brown Sugar Chocolate Cup Cake: Simply Delight ! Summer Nectarine Cakes : Great for lazy day !